Rewatching the James Bond films chronologically. The S.P.E.C.T.R.E. plotline from the first two films didn’t appear during Goldfinger, but it’s back in a big way in the fourth film, Thunderball. Bond blurb: S.P.E.C.T.R.E. agents hijack an airplane and steal two atomic bombs, hoping to ransom them to NATO for an outrageous sum. Bond, while murdering his way through various S.P.E.C.T.R.E. heads, in sent to the Bahamas to investigate. Bond background: Bond spends the first part of the movie at a relaxing health spa, where he dodges assassins and uncovers an important clue in the case, except that’s all by coincidence, because he doesn’t learn the facts of the case until later. Once again, we see that Bond is “on the job” even when vacationing. Bond baddies: The leader of S.P.E.C.T.R.E. is still known only as “Number One” and he’s still just a pair of hands stroking a cat. The main villain, though, is the eyepatch-wearing Largo, the guy with the swimming pool full of sharks. He has a bunch of henchmen, including the silent killer Vargas. There’s also a female assassin Volpe, who’s as smart as she is deadly. I’m totally in love with Volpe. Bond babes: Bond first romances Patricia, a woman at the spa. It’s an uncomfortable pairing, as she hops in bed with him while seemingly not liking him very much. Things get more interesting with Volpe and Largo’s mistress, Domino. Bond seduces Volpe, but she turns the tables on him by not joining his side. Not only does this excellently subvert Bond tropes, but it’s also character development for our hero. Bond’s experience with Volpe inspires him to come clean to Domino about who he really is and why he needs her help. Bond best brains: Q’s outlandish-for-the-time gadgets are all stuff that exists today – an underwater camera, scuba gear, a flare, and a Geiger counter small enough to wear on your wrist. 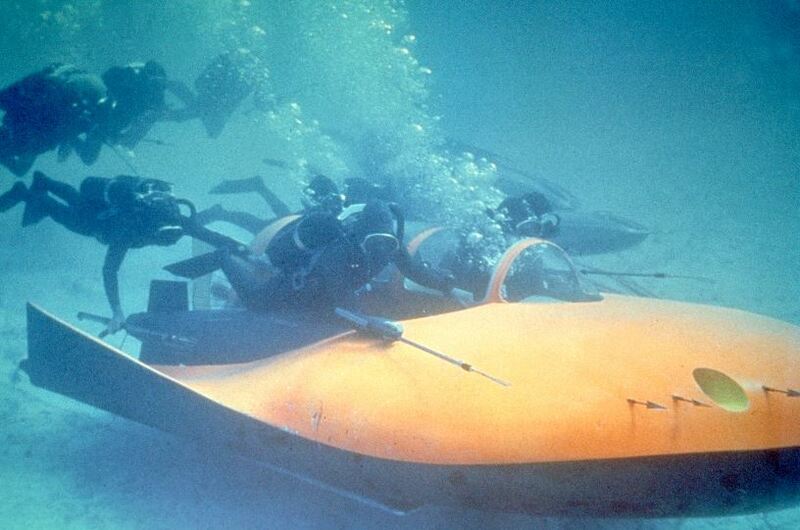 Bond bash-ups: Every Bond movie has a “this is the one with” and in Thunderball, that’d be the deep sea diving action. The underwater cinematography is gorgeous, and the creators do a good job of keeping it moving even though underwater fighting is usually slow-paced. Then, there’s the pre-credits scene, which is like something out of a cartoon. An enemy agent tries to escape Bond by dressing as a woman. They fight, and then Bond escapes with – wait for it – his flying jetpack!!! 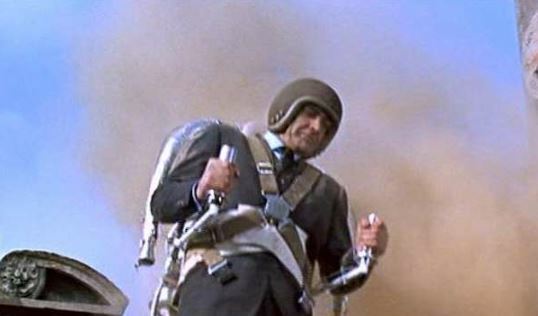 Bond baggage: What was the big thing in 1965? Only James Bond himself. It was the year of Bondmania, when all of pop culture was Bond-related. As such, the hype for the December ’65 release of the movie was insanely huge. 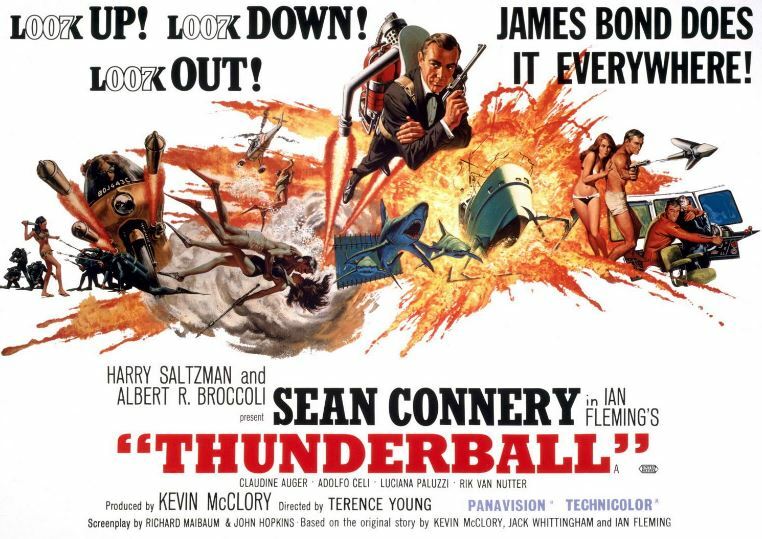 They say the Bond films are influenced by the era when they were made, but Thunderball was the one influencing everyone else. 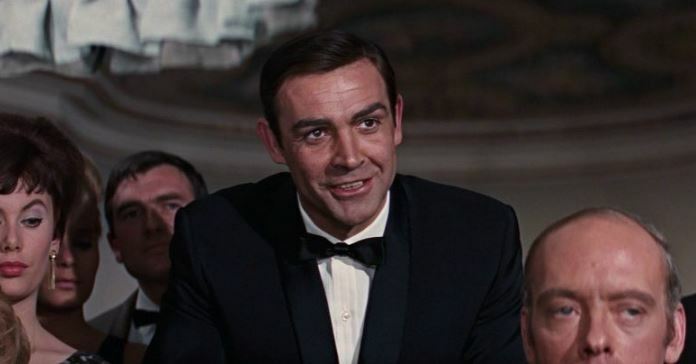 Bond babble: This one’s a little over-long and bloated. All the stuff at the health spa could easily have been cut, I imagine. But I still liked it. There are the underwater fights, the jetpack, an exploding car, a couple of Bond puns, and more. But best of all, I really, really liked Luciana Paluzzi as Volpe. She’s the “Boba Fett” of the Bond series so far, and if any Bond girl deserved a spinoff/prequel, it’s her. Next: I see you have a tiger in your office.